TeamSpec gives you the tools to create unique, professional requirements documents quickly and easily. By implementing custom document templates, which we call TeamSpec skins, you can reference work items efficiently and uniformly in your document. A skin is a textual representation of a work item's fields organized in in a Word document. 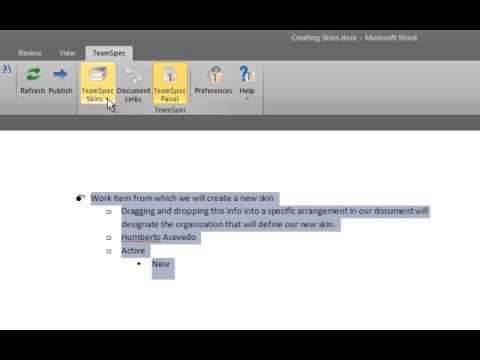 You can bring an existing work item into your document with a skin, or you can create a new work item using a skin as a framework. The beauty of TeamSpec skins is that they are fully customizable. Simply arrange an existing work item's fields in your document the way you want and save its organization as a new skin. With TeamSpec skins you can tailor the look and the layout of your requirements documents to your exact needs. Learn how to create new skins in TeamSpec. Skins allow you to quickly and easily import work items using Team Foundation Server (TFS) queries in a specified format to a Microsoft Word document.